How to choose industrial robot arms? You need to know the 5 main parameters for the robots. They are robot application, payload, the degree of freedom, maximum operating range (reaching distance or arm span), speed. The payload will be decided by the work-piece and the robot end tools like gripper welding gun etc. The degree of freedom will be decided by the actual robot movements which will determine the degree of the flexibility of the robot joints. The reaching distance will be determined by the moving track length. The speed will be determined by the working efficiency of the robot workstation needed by the final users. And you should also take the robot application into consideration. Some application only need 3 axis robots, some application has to use a 6 axis robot. Some application needs on-line programming and some application will need off-line programming. Robot arm manufacturer or suppliers will offer industrial robot arm specification documents which will show those parameter details. You can choose your robot arm accordingly. 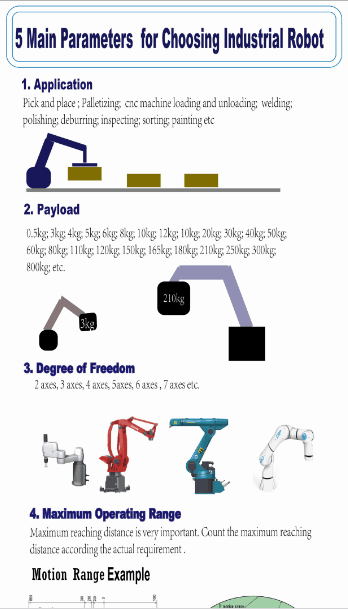 The below infographic by Sooyee Robotics focuses on introducing the 5 main robot parameters.